Vintage Christmas photographs from the 1930s. 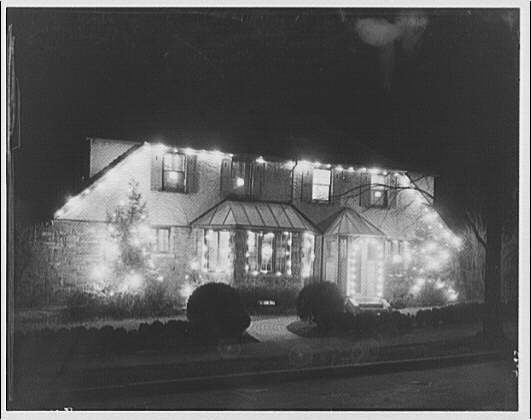 Having trouble finding Christmas pictures from the '30s, so if you have old family photos from this time, they'd certainly be appreciated! New York - January 1938. "Unemployed Workers." 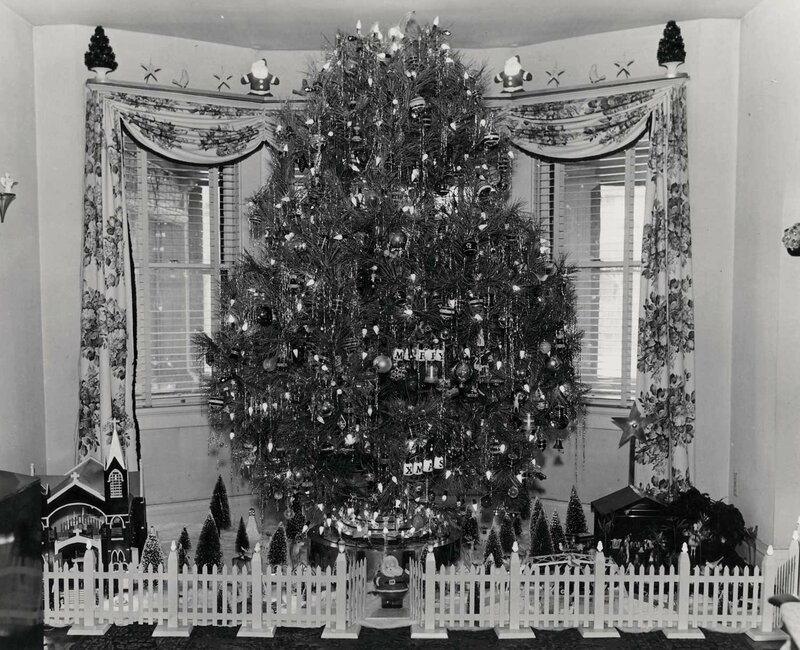 Tree left from Xmas 1937. Probably they just acquired this as an after-Christmas castway. Every one of these fellas was a kid, once, and had a real Christmas. - but they have a Christmas tree! Letter to Santa? Homework? This picture came with a bit of confusion about the date. One source said 1927. No way! Another said '37. More likely. 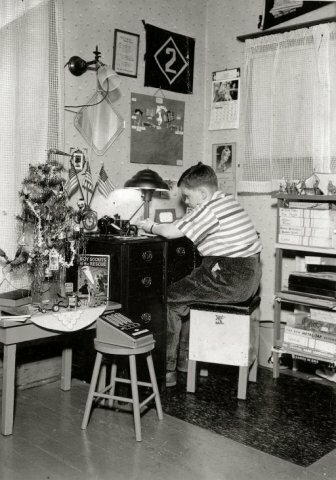 Someone else said they can see a 1941 Calendar on the wall. If so, I may have to move this one, but I can't make those numbers out, can you? 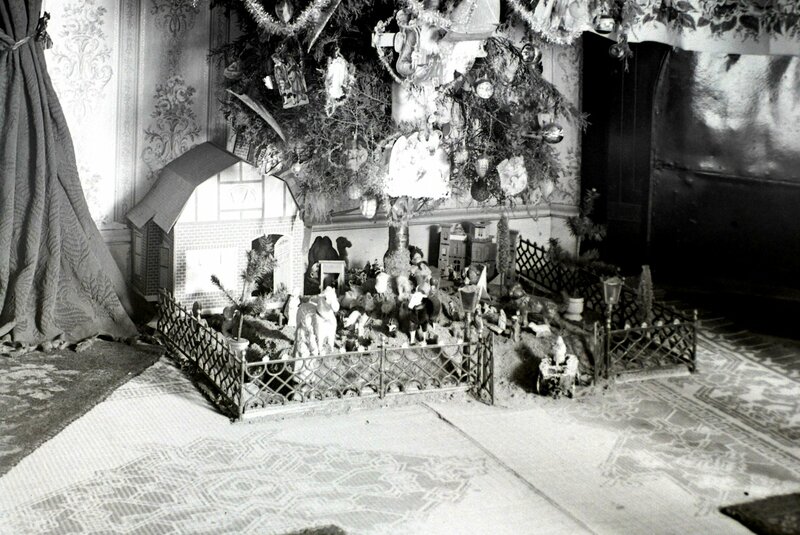 The first Rockefeller Center Christmas tree: - 1931. 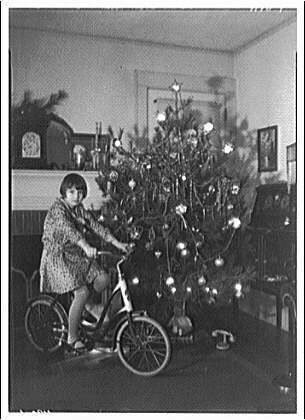 Christmas 1930 for a little girl named Norma Horydczak. 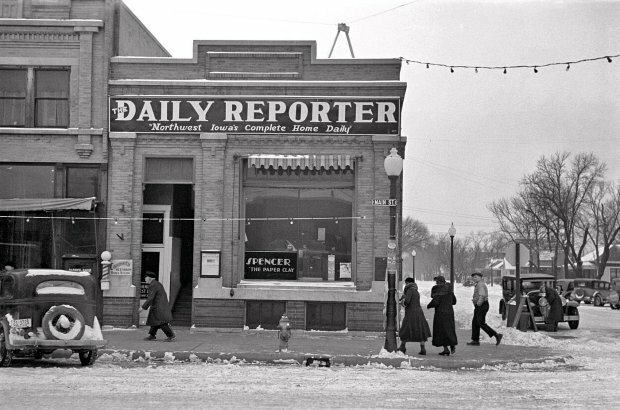 December,1936: - Spencer, Iowa. Note the lavish downtown Christmas lighting. 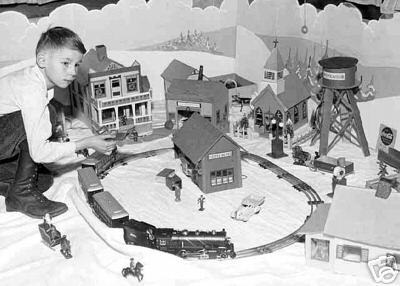 Christmas 1931-'32 for a boy with one of Lionel's first "0" gauge steam engine train sets.Looks like a #262 & T with 607,607,608 cars. A picture of a picture of a putz by a family named Schaffer - 1930. Oh, I'd love to have a blow-up of this one! A Lionel #8 Standard Gauge boxcab engine is pulling its string of #332,#337,#338 passenger cars. This is Lionel's smallest Standard Gauge engine of the period, but even so - note how it dwarfs the 0 gauge Chicago American Flyer station and how much wider the track is than the regular 0 Gauge track above. Wish I could see what's on that track above, but I do see lots of '30s Japanese cardboard houses, and we have two types of those Noma stamped-steel street lights and the ubiquitous German twig fencing again. The grand old "Standard Gauge," 2 1/4" wide, declined in favor of the familiar 35 mm "0" gauge from about the mid-'30s to The War. By 1939 they were selling only the track items and it was not revived postwar. However, as collector interest soared in the '60s, '70s and '80s, it has been revived and you can buy brand new track and trains in that gigantic old tinplate gauge again. In fact, more companies are making more tinplate trains right now than ever in the "Hay-days." 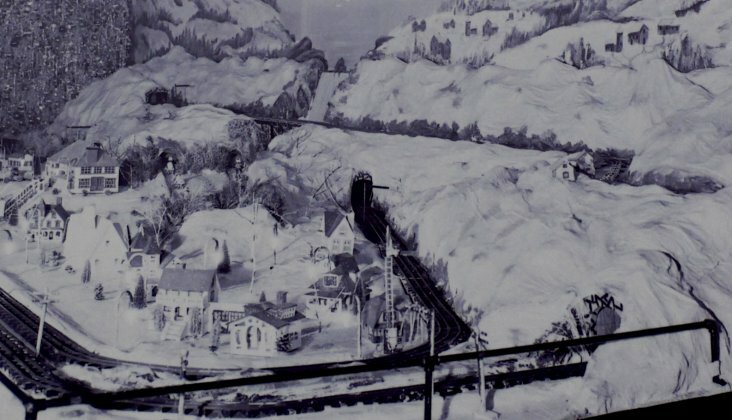 And interesting layout in which someone had cars moving around "tracks," instead of the usual trains - decades before the advent of slot-cars. It must have been compiicated underneath! 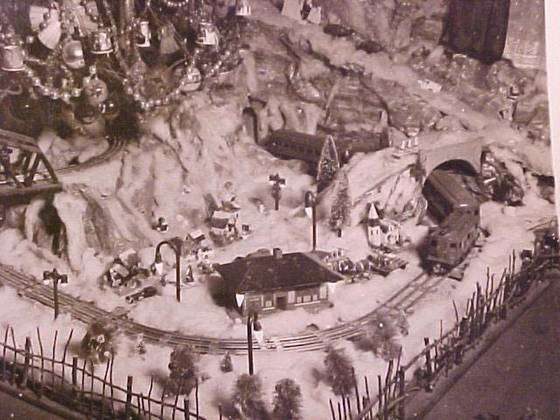 The Plasticville fence around the perimeter shows this picture had to be taken in the '40s, but the rest of it is from the '30s. 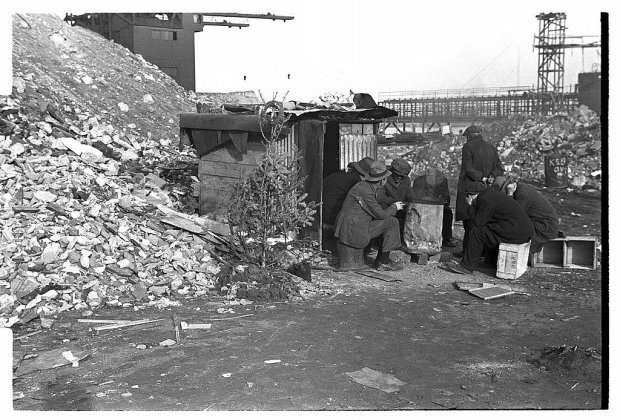 The cardboard houses definitely Pre War. After all that work you saved such a platform and put that same mechanized marvel up year after year. I bet it made a lot of noise! 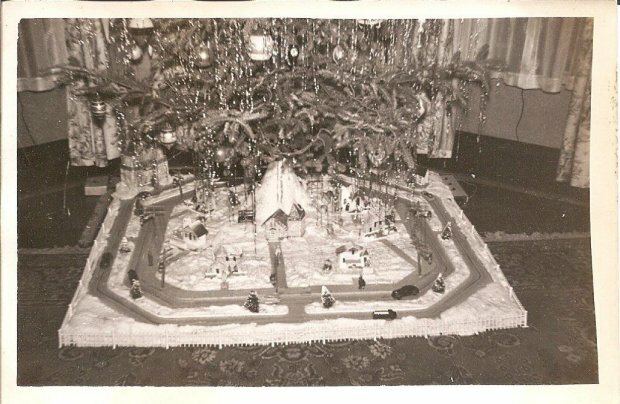 Remaining in the vein of elaborate home-made Christmas technology, "Grandpa" made this base to slowly turn the tree with complex electric slip-rings that permitted 6 circuits to revolve without getting all twisted up. I can see them... those metallic concentric circles with live house current exposed. Whew! Have they been lucky all these years! I wasn't sure where to put this picture. 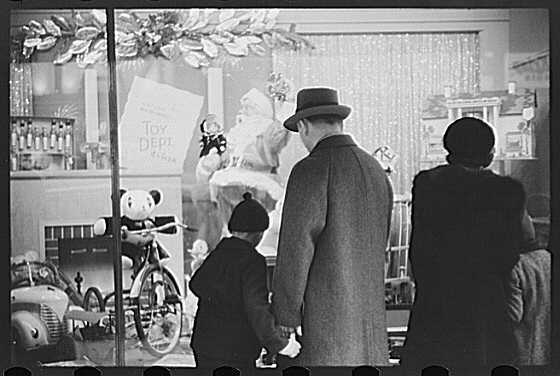 The archive source dates it "1950," and, indeed, we can clearly see those Noma 1950s illuminated plastic Santas everywhere. The contributor says his Grandpa made that base and other things many years before and so far - so good. My guess is he made that illuminated fence as well. He says that revolving tree base is still working - and he still uses it. 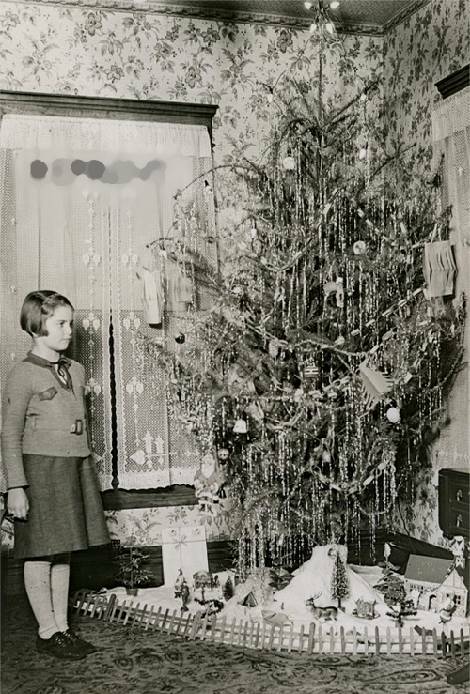 An unknown little girl by her tree in the early '30s. I've got a couple of those Noma electric tree-toppers. Remember those construction-paper chains and "Japanese lanterns" we used to make in school and at home while we had the measles? that were widely available, then. That's why I think that this is from the Thirties. Gee, I sure wish we could see the trains! (New Dec.2009)Another sent by Rob this year. 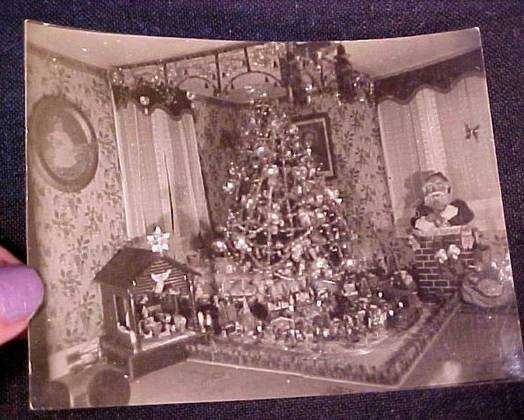 It would have fooled me unless Rob himself hadn't looked up that tin lithographed firehouse in the rear left corner, because everything else in this tightly-packed little putz - and on the tree as well -could be traced back to 1900 and before. Rob found the firehouse listed in toy catalogs of the 1930s and, indeed, the style betrays it. Here we find it all surrounded by a lovely Dent cast iron fence. That little lamp post by the gate is French. I have one in my own collection. The mold-cast metal base is hollow and holds lamp oil. Yes, it's lighted by a tiny flame and the delicate "glass" panels are "isingglass," or mica. It's clear from this that someone was keeping an antique style of Christmas in the 1930s. Dec., 1940: Providence, Rhode Island. A store front. 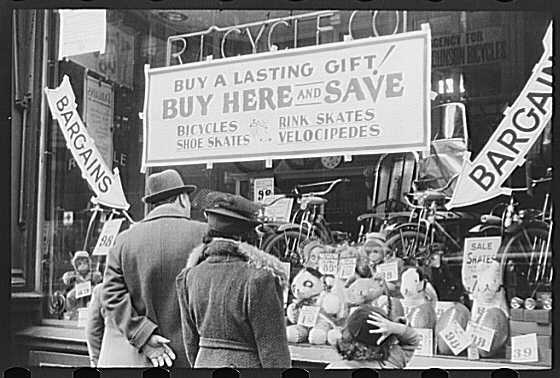 Another storefront in 1940 Providence. Things seem to be looking up, a little. 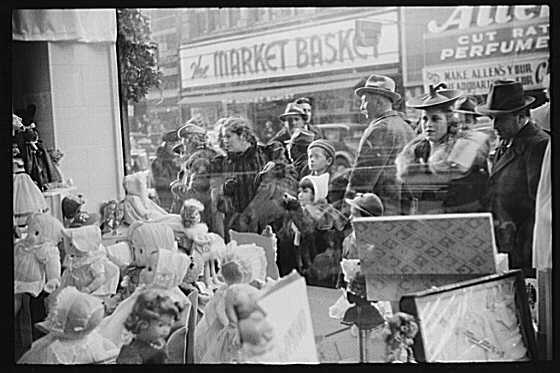 A 1940 Providence store from the inside looking out. Look at that woman's hat! Is that a faucet on top? 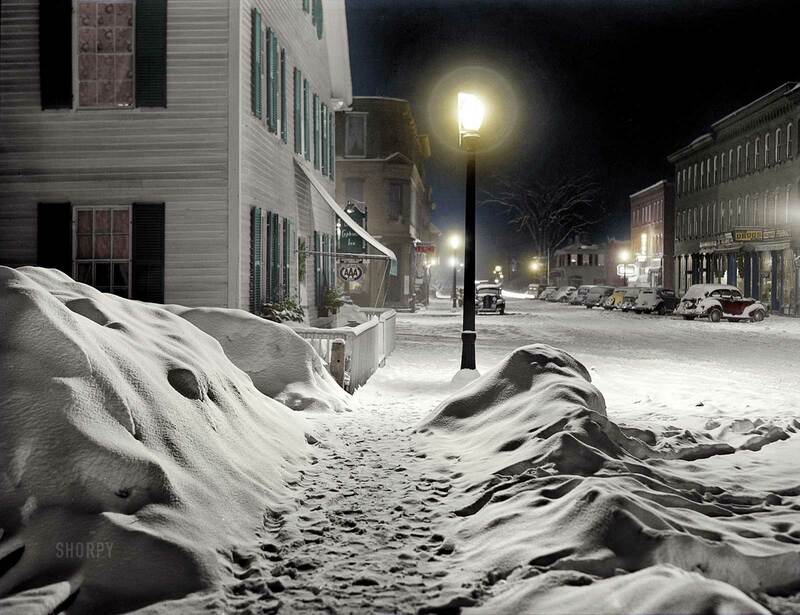 Woodstock, Vermont: Christmas 1940. This is slightly colorized,but the clarity and brilliance of it just takes my breath away. The snow. Those cars. The cold serenity. This is what Christmas looked like when I still believed in Santa Claus.